What is a laptop drive? Just imagine a canned food drive, but with laptops! Starting NOW and running through December 31st, 2018, Aloha Overstock is running a Laptop Drive to collect 10,000 laptops! All the laptops collected will be sent off to a responsible E-Waste Partner where they will be refurbished if possible, and disassembled and dismantled for parts, and scrap metals if not. For every laptop collected, we are offering $1 of Aloha Overstock credit to your favorite Oahu Public School. That school will then be able to use their credit towards the purchase of printer supplies (ink, toner, etc.) they may need. Let's keep these laptops out of our islands landfills! With your help, we know we can reach our goal! Great question! We accept all laptops regardless of function. Got the cords for the laptop? We'll take those too! Batteries? Don't worry about that, we'll take that as well. Basically if it belongs with the laptop, we'll take it! If your laptop has a cracked screen, while not ideal, we'll still take it. We are always looking for hard drives, so please consider including them with your donation. That being said, laptops with removed hard drives are accepted as well. Awesome! Is there anything you do not accept? Currently, we take just about any laptop, but if the laptop is in pieces, we will NOT take that. We know some people are worried about security, but if you drill holes through the laptop, or smash it with a hammer, we will not accept that either. Do you erase the hard drives or remove our personal information? No. We do not do any of that. Again, we are always looking for hard drives, so please consider including them with your donation! All laptops turned into Aloha Overstock should have their hard drives erased completely, or have the hard drives removed before coming to us! Where do we drop the laptops off? Can you pick them up? Currently, we are accepting laptop donations at our warehouse. Feel free to come by during our business hours and drop them off. Please let us know what school you would like to donate to, and we'll handle everything from there. In regards to picking up laptops, we will do so, if you have a minimum of 20 laptops ready. There is no maximum amount of laptops! What do I get for donating a laptop? 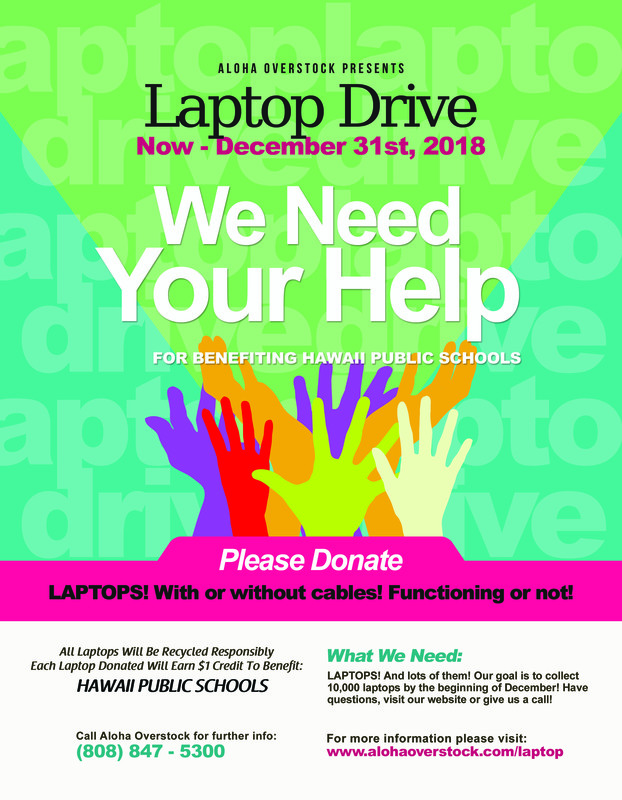 Now through the end of December, for every laptop donated, we will give $1 credit to the Hawaii Public School of your choice. With that credit, schools will be able to purchase ink and toner for their printers, which will allow students and teachers more opportunities to learn! It also makes you feel really good for keeping e-waste out of our Oahu landfills! This is so awesome! Do you have a flyer I can download / email / print? Sure we do! Check it out!